Love the beach but not the traffic and hassle of going through the tunnel to get there, discover Buckroe Beach! Our incredible ¾ mile beach offers a panoramic view of the Atlantic Ocean as you look across the mouth of the Chesapeake Bay! Sink your toe’s into our clean sandy beach, enjoy our sparkling water and gentle surf and watch ocean going ships prepare to arrive at their ports of call. 2018 will be the most active and exciting summer ever experienced at Buckroe Beach! The season kicks off on Memorial Day and runs through Labor Day, the beach is opened daily from 10 a.m. to 6 p.m. with lifeguards on staff during those hours. Separate from the beach, there is a playground for the kids and picnic shelters for families & groups. 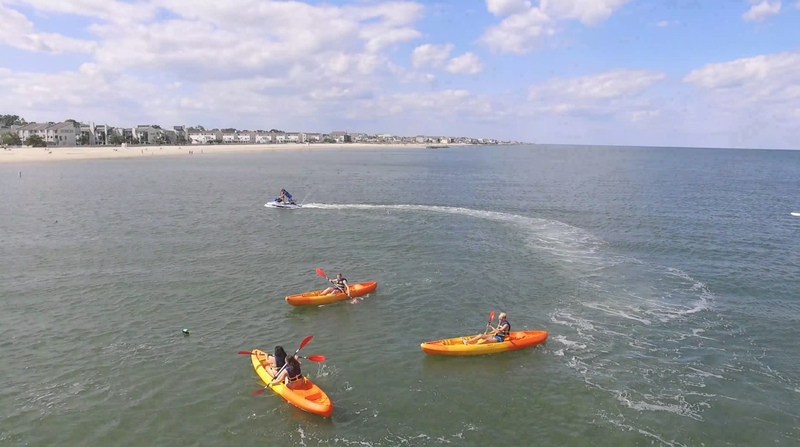 Hampton Watersports rents jet skis, kayaks & paddleboards on the beach and this year they are introducing scheduled jet ski tours of historic sites and local sea life. Click on this tab to reserve water equipment or book a tour. They also have a retail center which provides a wide variety of hot food to go, cold beverages, ice cream, snacks and bags of ice. Picnic tables are next to the facility for their customers use. Have a group of 8 or more and would like them to provide lunch and reserve a table, click on this tab. Finally, don’t worry if you forgot your umbrella or run out of sunscreen, not a problem they carry a full line of beach essentials. So make your plans now to experience a great summer experience at Buckroe Beach! Free parking & a very friendly beach staff, make this a “must do” visit this summer!